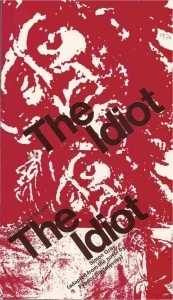 The Idiot is a dramatization of Fyodor Dostoievsky’s original novel. In creating this stage play, Simon Gray chose some of the most vivid and contrasting episodes recounting the strange involvement between Prince Myshkin, the good natured ‘Idiot’, the beautiful Nastasya Filippovna and her desperate lover and husband, Rogozhin. 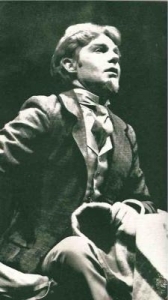 The ambiguity of these episodes and the paradoxical atmosphere of Dostoievsky’s novel – hovering between sombre tragedy and grotesque farce – is heightened by the use of a strange, sinister commentator, the character of Ferdyschenko. When it was first suggested that I should think about adapting The Idiot for the stage, I delayed refusing at once only, I suspect, because I wanted a week or two in which to rest on the compliment. I hadn’t read any Dostoievsky since, at the age of seventeen and in a state of some intoxication, l had run through all the major novels within a matter of months. In those days, I had actually seen myself as spiritual nephew to Stavrogin. I was a despairing conscious hero whose every gesture and phrase revealed the futility of a world gone mad with convention. I was living, I should say in Halifax, Nova Scotia, and in retrospect I quite understand that I must have cut a somewhat disturbing figure there. I spent many afternoons picking a path, my lip curled in sardonic contemplation, through the town’s rare shadows; and many evenings framed in the windows of small restaurants where I toyed with second and third slices of cherry pie while I allowed my moody eyes to meet, through the glass, the bland gaze of passers-by. Between my darkness and their brightness, there passed a glance of great politeness. I had glamour, borrowed but desperate. What had they, poor things, but their small certain pleasures? The one major novel for which I didn’t care, which I found soft in its centre while prone to intolerable longueurs on its perimeter, was The Idiot. The Prince’s sweetness struck me as a betrayal of my very personal expectations – which had grown through Raskolnikov to Stavrogin, and which had led me to look forward to a deeper and still deeper descent into the abyss. Anyway I was sufficiently homme de theatre to have noticed in the university at which I was an undergraduate those poseurs who had already thrown fits in lecture-rooms, and just outside them, and whose dreadful sufferings their gentle smiles had made famous in that world in which I was determined to find my own extravagant role. Rogozhin, a madman and therefore, my only possible model, possessed in the translation in which I encountered him an accent so quaintly and unconvincingly cockney that it had the effect of making all his actions, however passionately recorded in the narrative, equally cockney, quaint and unconvincing to my imagination. On the other hand Stavrogin remained, among other nihilistic things, a gentleman and an intellectual, and thus already resembled myself in two important particulars. By the time, some years later and in England again, I had come to think of myself as at least partly detached from my younger and more excitable readings, I had buried my memories of Dostoievsky as I had buried other embarrassing post-adolescent excesses. I was sure (I still am) that Anna Karenina was the greatest of all novels, I read Mansfield cheap xanax online no prescription Park eight times, Middlemarch six, the whole of Dickens twice and parts of him three times as often. On the few occasions when I was persuaded to ‘try’ Dostoieysky again, I failed not only in my attempts to re-read The Devils, but also to read for the first time everything that I had previously missed. Of all authors, he was the one I was least likely to want to adapt; of all his novels The Idiot was the one that held not even a dim and wryly ‘placed’ appeal. But I hadn’t refused the invitation directly, and it was a necessary courtesy to skim swiftly through the novel before declining to involve myself in it further. It is a novel that is not lightly skimmed. The plot is complicated; the characters prolific; the proportions eccentric. In fact The Idiot was turning out to be a case (Dickens is another) where skimming is more laborious than actual reading. So after an evening spent at ten pages a minute with nothing assimilated but a few preposterous little melodramas, I was forced to start again. I read slowly, carefully, with increasing astonishment. For The Idiot I encountered now was not The Idiot I had misremembered (though it met, if not a hostile response, then an equivocal one); the perimeter of the novel, which I had totally forgotten, which had vanished far beyond even misremembering, I now found marvellous – marvellous in its detail, marvellous in its abundance of richly appreciated life, marvellous in its curious and desolating comedy. And my recognition of this prompted an uncertain but growing recognition that there was, also and above all, a theme. A theme that made the perimeter not a perimeter at all, that made even the most seemingly inconsequential observations part of a painfully, at times even hatefully, felt whole. There was something else. However frequently I was blocked by impenetrably Russian obscurities of religious reference, I was weirdly at home with the novel in all its most extraordinary effects. In other words the world of The Idiot had (for me) in its texture a varied Englishness – no, not quite and so chauvinistically that– rather a distorting but robustly animating focus which, in my Englishness, I found irresistibly familiar. The characters, as I summoned them up in retrospect, assumed some of the nightmare distinctness of faces from a Hogarth print – almost as if straight from some recent racial memory; and from there it was a short step through the illustrations of Phiz to the world of Little Dorrit. I offer this sketch of what was scarcely even a critical process with some embarrassment – no doubt the connection between Dickens and Dostoievsky has long been an academic common-place. It was nevertheless my starting-point, the point from which I began both to feel my response to the novel’s tones and comedies in terms of theatrical details, and through them to become excited at the prospect of attempting to give to that distressing and urgent theme an appropriately personal and (hopefully) theatrical shape. And if it explains neither of these things, it will at least explain why I have resolutely insisted, against the most genial opposition, on using the English form of address for characters who are, generally, thought of as extremely Russian. For me, over the last months, General Yepanchin’s wife has become as emphatically Mrs Yepanchin as Mrs Micawber’s husband is Mr Micawber. And perhaps what this whole note really amounts to is nothing more than a tedious defence of that trifling liberty. As to whether my excitement was justified, or whether I wouldn’t have done better to have rested on an undeserved compliment, only the play itself can establish. The Idiot is now available as a Faber Contemporary Classic in Simon Gray: Plays 3. To order a copy on special offer at 25% discount please contact Faber using code GRAYPLAYS. Or check out the plays section of our bookshop. For UK and Worldwide professional rights please contact Judy Daish Associates at rozzy@judydaish.com. For amateur rights please contact licensing@judydaish.com. For amateur rights in the USA and Canada, apply to Samuel French Inc at www.samuelfrench.com.